I'M BACK....ok, I've been back for 5 days now, but I've been busy unpacking (my liver) and getting ready for school - YEE HAW!!! I'M SO EXCITED SUMMER IS ALMOST OVER!!! The FOOD IS JUST BEYOND.....I had a bowl of chicken andouille gumbo at the GUMBO SHOP in the FRENCH QUARTER that was so good it made me wanna slap my grandma! So my trip inspired (or maybe re-inspired) me to encourage (force) my children to try new foods. We all know kids can be picky eaters, but we have a rule in my house - The "NO THANK YOU BITE" (thanks to Jake and Baylie's wonderful Pre-K teacher Mrs. Becky)...everyone MUST take a "NO THANK YOU BITE"...meaning: you ask them if they'd like to try a bite, they say no thank you and you say TOO BAD, YOU GOTTA TRY IT! (I'm not sure that's exactly how she explained it, but I put my own spin on it :)....and I gotta say, it actually works! I swear some teachers are born with magical powers. NOTICE MY HELPER IN THE BACKGROUND...A LITTLE WINE! YUM! It has it all: shrimp, onions, garlic butter, tomatoes, creole seasoning, red beans and rice didn't miss her (you know you were singing it in your head)...all things my kids would cringe at if they knew they were in there...luckily, they weren't home when I made it, they were out playing with their friends and lucky for me when they did return home, they both had worked up quite an appetite. Baylie isn't usually as picky as Jake when it comes to trying new things. In fact, I'm sometimes blown away by what she likes versus what she doesn't like: I mean what kid would choose a salad with black olives, feta and sun-dried tomato dressing over a peanut butter & jelly sandwich? I've even tried to tempt her with a FLUFFER NUTTER (pretty much the only thing I ate when I was pregnant with her, I guess that explains it, nevermind!)... but that's my Baylie. Jake, on the other hand, could pretty much live on Chicken Fingers, Fries and Apple Juice. He'll eat his veggies and some other kid friendly foods, but he's usually not too keen on trying "exotic" things like sushi, whereas Baylie would prefer sushi over mac n' cheese. Anyways, when they got home they were starving. So this is what they got. I didn't make a big fuss about making them try it, I just plopped it down in front of them and didn't give them a choice and you know what???? THEY BOTH GOBBLED IT DOWN LIKE THEY HADN'T EATEN IN A WEEK! LOVE IT! 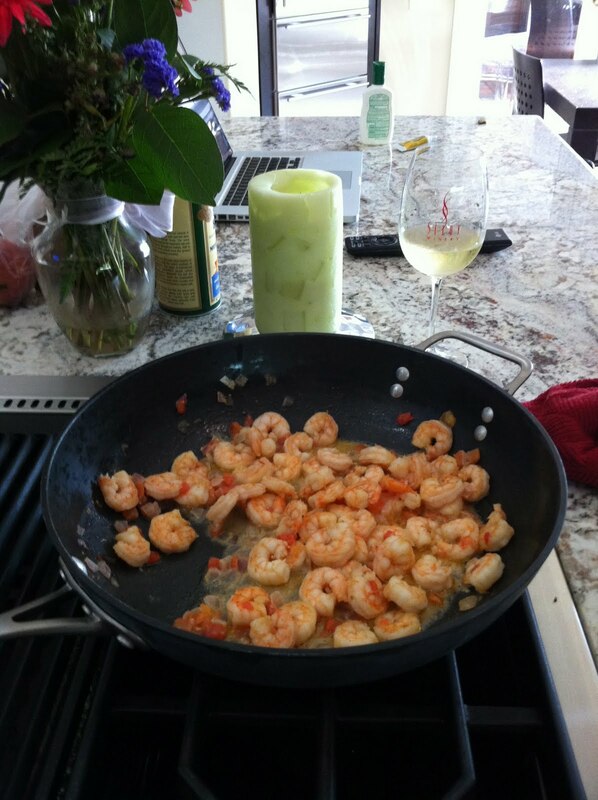 I'm not sure why, but watching them eat this dish made me feel really good (might've been the wine, but just go with it)...It was like I'd accomplished something as a mom...my kids actually like shrimp...they like a little spice...they'll eat red beans and rice ALL MIXED TOGETHER! SCORE ONE FOR MOM BABY!! !